Djordje Mihailovic says his dream growing up in the Chicago area was always to play the Chicago Fire, so it was a huge blow when he was injured in the Knockout Round of the 2017 MLS playoffs. Mihailovic, then only 18, had emerged as a late-season starter as a central midfielder for the Fire, which was making its first postseason appearance since 2012. At first, he thought he had torn his hamstring making an awkward slide tackle in the second half of the 4-0 loss at home to the New York Red Bulls, but the Fire medical staff immediately suspected it was a lot more serious. The day after the defeat, Mihailovic's injury was diagnosed as a torn anterior cruciate ligament in his right knee, so severe he was out 10 months, missing the first five months of the 2018 season. "Mentally, it was hardest to deal with," Mihailovic told Soccer America before the USA's practice on the eve of Saturday's friendly against Costa Rica in San Jose, California. "Physically, you push yourself, day in and day out. But mentally, seeing your teammates go out to training all happy and watching the games from the sidelines is tough, but it is something that builds you." When Mihailovic returned to the Fire on Aug. 18 against Montreal, the Fire had a seven-game losing streak and going nowhere. But he was a bright spot for the Fire down the stretch, recording a goal and an assist in a 3-1 win over LAFC, one of the Fire's best games of the year, and finishing with four assists in eight starts. 'I wasn't surprised.' Mihailovic, who only turned 20 in November, was rewarded for his comeback with a call-up to the U.S. national team for its first camp under new coach Gregg Berhalter. "I wasn't surprised," he said. "I was more excited. Based on my performance and all the hard work I did to come back so strong, it was kind of the end product. It's an honor to be called into the national team, being one of the players that Gregg and [general manager] Earnie [Stewart] think have quality and the ability to produce what they expect out of the national team. To come back, 10 months from tearing your ACL, is certainly something you have to be proud of." Late runs pay off. 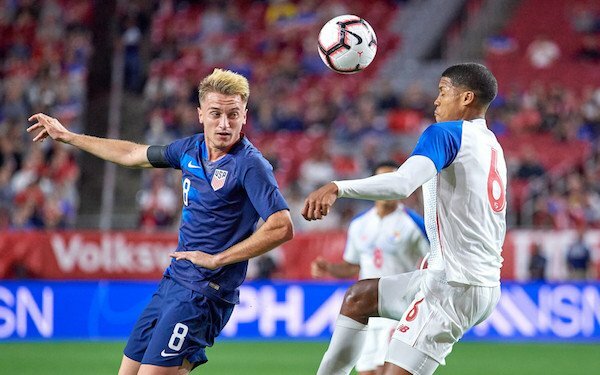 Mihailovic, the youngest player called into the January camp, scored the first goal in the 3-0 win over Panama, justifying the start as an attacking midfielder in Berhalter's first game in charge. "The main thing he is looking out of me is my movement in relation to my teammates in the new style he is implementing on the national team," Mihailovic said. "It is going to take time to get used to it, but I think over the last three and a half weeks, everybody has been outstanding with that. He's really looking for me to find the ball and split lines and be dynamic in the attacking third and make late runs like I did against Panama." A coach's son. After the match, Berhalter praised Mihailovic for his intelligence and the small things he does on and off the ball -- all things you might expect from a coach's son. Mihailovic's father, Aleks, was an All-American at Jacksonville University and played for the Washington Diplomats and the Jacksonville Tea Men in the NASL. After retiring as a player, he went to coaching and started the Chicago Blast. "He's really proud of all the work I did to get to where I am," said Djordje, who gave his father his jersey after the win over Panama in Arizona, "and he's a coach so naturally so he's always pushing me, always finding things I should work on, and that's what I am most grateful for. He was really into the details of being a player and that's where he got me to where I am." At the age of 14, Djordje left his father's club for the Fire's academy program. "It wasn't hard," he said, "more of a challenge. He always wants to push me. Always being coached by him was a great thing, but leaving the club was a difficult decision." Homegrown Player signing. Two years after joining the Fire academy program, Mihailovic helped it win the Development Academy's U-17/18 division. Unlike teammates Cameron Lindley, who plays for Orlando City, and Andrew Gutman, the 2018 Hermann Trophy winner who signed this week with Scottish champion Celtic, Mihailovic stayed at home, signing a Homegrown Player deal with the Fire out of high school. "It was a privilege to grow up in the city and watch the team play all though my childhood," he said. Mihailovic's favorite player on the Fire was Brazilian midfielder Alex whom he got to face in 2017 when Alex moved to Houston. His injury in 2018 was just one of several Chicago head coach Veljko Paunovic had to deal with as the Fire slumped to 8-18-8 and fell to 10th place in MLS's Eastern Conference. "I think we definitely want to put away what happened last year and rekindle what happened in 2017," he said. "Pauno and [Fire president] Nelson [Rodriguez] have a vision for the club and guys that they think will fit in the system. I think it is going to be a real exciting year for us." 3 comments about "First cap: Young Djordje Mihailovic confidently breaks into U.S. lineup". Wooden Ships, February 2, 2019 at 8:46 a.m. This call up gives me some level of optimism that we are thinking soccer first. DM is fun to watch. frank schoon, February 2, 2019 at 11:15 a.m. I always give extra credit to a player whose last name ends in "ic"; for it tells me he has some "Yugo" blood in him. Ben Myers replied, February 2, 2019 at 12:23 p.m. Yes. The old Yugoslavia has long been called the Brazil of Europe. Noawdays, its component parts carry the reputation forward. And émigrés, too.